On the first weekend in August, my Greyhounds have a standing date to meet Klingons, Ferengi, Star Fleet officers, assorted aliens, and thousands of Star Trek fans. The occasion is the annual Star Trek convention in San Francisco. Star Trek fans are as devoted as dog show fans. Every weekend of the year a Star Trek convention takes place somewhere in the country. At these events, actors from the various Star Trek series answer fans’ questions, tell stories about their experiences in filming the shows, and sign autographs. The conventions are six hours long, lasting from noon until evening. Interspersed among the speakers are special events like the costume contest, an auction of Star Trek merchandise, previews of new science fiction television shows, and fast paced music videos featuring Captain Kirk, Mr. Spock, Q, Captain Piccard, and others of the Star Trek universe. And if there is still time to fill between speakers there is a dealer’s room where booths sell a bewildering variety of science fiction items. You can buy Star Trek uniforms and insignia, phasers, videos, jewelry, Klingon weapons, starship models and posters. I am particularly fond of the Bajhoran earrings. 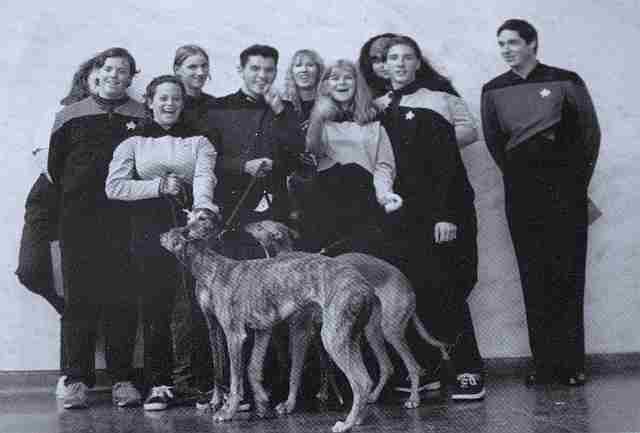 As a long-time fan of both dog shows and Star Trek, my first visit to a Trek convention accompanied by dogs was five months before Kira was born. A woman that I had long wanted to show for was judging Greyhounds at a show halfway between home and San Francisco, on the opening day of a two-day Star Trek convention. Leonard Nimoy (Mr. Spock) was speaking on the second day and he is one of my favorite Trek actors. So it seemed reasonable to leave the dog show after an early show time and drive on to the convention to buy a ticket for the next day. What I hadn’t counted on was that Sheena, Star Traveler and I would be at the convention for five hours, meet hundreds of fans, and have James Doohan, (Engineer Scotty from the original series) admire the dogs. It was also unexpected that there would be Greyhounds and Klingons on my next Christmas Card. The San Francisco convention is held at the Masonic Temple, whose main architectural feature is a large marble entryway. When Traveler, Sheena and I arrived we found the portico filled with fans who were lined up waiting to get the actors’ autographs. And while dogs were not allowed in the carpeted auditorium, they were welcome in the entryway. They were more than welcome. They were admired, petted, discussed and fussed over. They had a fine time. And when they got tired there was a nice cool marble floor to lie on for a rest. We arrived to find Max Grodenchik (Quark’s brother “Rom” from Star Trek: Deep Space Nine) doing autograph duty and it was surprising to discover that, without all his Ferengi buck-toothed makeup, he was a decidedly handsome young man. Even when I am at conventions without the dogs, I don’t collect autographs myself, but like to watch the actors interact with the fans. So I generally stand near the head of the line, but off to one side, to watch the stars and the star-struck fans meet. The fans in the autograph lines wait for an hour or more and a couple of distinctive looking dogs relieved the tedium of that wait. They loved Traveler’s full name of Star Traveler. After introducing the dogs to dozens of folks I started explaining that Sheena and Traveler were really aliens in costume for the costume contest. That went over well. The actual costume contest was scheduled for later in the day, and a fair number of the fans were dressed like their favorite characters. Non Trek fans may have been a little baffled, but most folks loved the cards and some passed them on to other friends to share the fun. The last speaker of the day was James Doohan (Scotty of the original series.) A favorite with the fans, he is one of the few actors from whom audience members request hugs. And he gives them. By this time Sheena and Traveler were ready for a nap on the marble floor while I watched Jimmy sign the last of hundreds of autographs. As Mr. Doohan rose to leave he came by to say, “Beautiful dogs.” Then he was gone and the convention was over. When Kira was seven months old I loaded her and Sheena and Starfleet in the car and headed for San Francisco to meet the puppies’ first Klingons. I was very pleased with their nonchalance as they walked into the crowd and saw their first aliens. Fans in the crowd remembered us from the previous year and loved the puppies’ names of Starfleet and Kira. Most of the fans understood that red-furred Kira was named after the red haired Major Kira from Star Trek: Deep Space Nine. One of our old style Klingons from last year was present, so I gave him a copy of the Christmas card with his picture. He was amused. And I recruited a couple of new style Klingons for this year’s photo. (New style Klingons have the bald foreheads with ridges that first appeared in Star Trek: The Next Generation.) This time Sheena was tranquil as I left her with the Klingons for the photo. The puppies were startled, but the Klingon ambassador sweet-talked them and knelt down to appear less intimidating. Later I also took puppy photos with a squad of Star Fleet officers, and yet another set of Klingons. There was a major entry of Klingons attending. Partly this was because the first speaker was the best known Klingon of them all, Michael Dorn (Commander Worf). In his honor the local Klingons had entered the costume contest as a group. They took second. The winner was a new contestant, a stunning version of the “Predator” in the Arnold Schwartzenegger movie of the same name. Third place went to the Cylon, a silver mechanical man from Battlestar Galactica. Perhaps next year, when the puppies are old hands at this, I can pose them with the Predator or the Cylon. Or even with the Predator AND the Cylon. By the end of the day Kira and Starfleet had met hundreds of people, many in unusual costumes. They met a young man in a mechanized wheel chair, the first they had seen. Star Trek conventions attract a goodly number of wheel chair bound fans. By the end of the day Starfleet stretched out on the floor and Kira climbed into my lap for a nap. And if the fans found her cute when she was awake, Kira curled up for a nap was irresistible as she attracted attention and kind comments. Then it was into the car for the two-hour drive home. The dogs slept all the way. We will go back next year. It has become an annual event. The dogs have fun. The fans have fun. And the interaction is good for both groups. A lot of people get to see that Greyhounds are friendly. And the dogs get to see that even people in alien costumes are friendly.